Jim was leading Joe and me to the grave. Or graves. I wasn’t really sure if there would only be one, or if there would be two. Either way, I had never been in this part of the forest before and didn’t really know where he was taking us. My phone was failing to connect and find my location. That left me wishing I had a pocket full of breadcrumbs to start dropping. 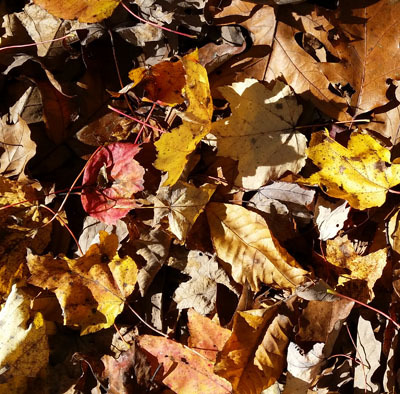 A low, bright sun pierced the crisp air – a perfect late November day. Most of the leaves were down now, opening up the view through the trees. Jim was leading us on a hike to the Tadlock graves, one of the lost Uwharrie places that few people remember and even fewer know where to find. Jim had visited the graves last month. They were somewhere between the Thornburg Trailhead and Cooler’s Knob Mountain. That was the extent of what I knew about where we were going today. Is there a better way to start a hiking adventure?! We walked along a lightly-used gravel road that was little more than a driveway. “We should probably turn into the woods near the top of this next rise,” said Jim. He had the GPS coordinates for the graves in an app on his phone and was using the app’s map to guide his choice of direction. At the top, we left the road and crunched through the leaves. “A friend of mine found the headstones one day while out wandering through the forest,” Jim shared when I asked how he had learned of the graves. I’d only known Jim for a handful of years. The more time I spent with him, the more I realized he knows about this area. What better companion to have for a hiking guide?! A long shallow depression cut across the forest floor in front of us, continuing out of sight to either side. It was the vague impression of a long-abandoned road. ‘Road’ might be too strong a word. How should one describe what might have once been no more than some wagon ruts or a dirt path across a farm field? Many of the ‘old roads’ in the Uwharries pre-date the internal combustion engine. People on horseback or horse-drawn wagons used them. Other ‘old roads’ were just temporary paths pushed open during mid-20th-century logging operations. It was hard to tell at first glance what this particular old road might have once been, but it was leading in the general direction Jim wanted to go so we followed it. A few minutes later we reached a small open space among the trees. It was an intersection of sorts. The old road we had been following junctioned into another that was slightly better defined. Several small mounds were scattered among the trees around the clearing. “This must have been a loading deck, where they loaded up logs before hauling them away,” said Jim. When loggers came in to cut timber, they would clear off a central area to work in, pushing aside any brush, dirt, stumps, and rocks that were in their way. These debris piles rotted down over time, leaving tell-tale mounds of dirt and rocks that looked different than naturally-occurring land shapes. The larger road led across the broad saddle where we stood and on toward the hill to our left. “That’s the direction of the graves,” Jim indicated, so we turned that way. We hadn’t taken more than a few steps when we noticed a tree off to our left with a couple of old rusty signs nailed to it. Since we were exploring, it was probably worth seeing if the signs were still legible at all. They appeared to be completely covered in dark rust, so I didn’t expect much. As I got closer, the ‘dark rust’ started to look more like the color of tarnish. Faint streaks of greenish-white oxidation ran down the signs. A few spots of shiny yellow glinted along the edges. “Hey, these signs are made of brass plate, not rusty tin,” I said. The bottom sign had lost its upper nail and was leaning forward, mostly facing the ground. The top sign was still held up by three nails. As I looked closer at the upper sign, I could make out letters hand-punched into the metal. Upper sign at the Tadlock homestead camp. “These look like Joe Moffitt signs!” I lifted up the lower sign and bold, black-painted letters across the top declared “UWHARRIE TRAIL”. There was more punched lettering below them. Lower sign at the Tadlock homestead camp. Why were some of Joe Moffitt’s signs here? As far as the three of us knew, the Uwharrie Trail had never been routed this far to the west. Why were these signs made of brass plate instead of the iconic aluminum plate that Moffitt used for the rest of his signs? We were excited to have found them, but the signs raised more questions than they answered. I had been thinking a lot lately about lost Uwharrie places. I had only recently heard about the Tadlock graves and was looking forward to ‘finding’ them with Jim’s help. But I had no idea we’d rediscover another one of Moffitt’s camps today! These signs had likely been lost from common knowledge for decades. They were a perfect example of a lost Uwharrie location. Along the top edge of the sign, in smaller letters, were the words: BE PREPAIRED. Along the bottom edge were the words: DO A GOOD TURN DAILY. 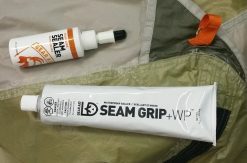 The letters ‘CAMP’ were punched on the left side of the word ‘Trail’. To the right side were punched the letters ‘NO’. A disappointing blank space followed. That’s where the camp number should have been punched. No dates were found anywhere on the signs. The signs were apparently going to keep some of their secrets. “Could this be one of the first camps?” I wondered. “I could believe Joe Moffitt found brass to be too expensive for signs and switched to aluminum for the later ones.” We had all heard the story many times about how the aluminum used for Moffitt’s signs were the blanks that got stamped into crumb trays for toasters at the plant where he worked. We took a few dozen pictures, trying our best to capture the lettering on the signs for future study. Maybe we also hoped that capturing them in pictures would help keep them from being lost again. “Look over here,” called Jim. “This was probably the chimney-fall from the Tadlock home.” He was looking at one of the mounds on the other side of the clearing. It contained quite a few rocks that were block-shaped and flat-sided. The kind that would have stacked well. Maybe not all of these mounds were from a logging operation. Using the information we saw on the signs, we headed north to look for a spring. The shallow valley on that side of the saddle funneled down into a narrow gap. “I think I found it,” said Joe. From below a little drop-off in the gap, we could see a rock wall about three feet high and eight feet across. It was obviously hand-placed and not a natural formation. No water was seeping from it or standing in the gully below it. We weren’t 100% sure we had found the spring cleaned out by the scouts. We looked around a bit more but didn’t find any other likely possibilities nearby. We finally spotted a slightly brighter bit of gray off to the right. It was peeking out at us from behind gray tree trunks, gray logs on the ground, and a few gray rocks. Mr. and Mrs. Tadlock shared a headstone but had individual footstones marking their final resting place. A tree had recently fallen across the graves, narrowly missing one of the footstones. Across the bottom were the words “Resting in hope of a glorious resurrection.” The footstones bore the initials “E T” and “J W T”. The stones were all in pretty good shape. It was possible they had been here for 103 years, but I wouldn’t be surprised to learn their descendants placed the stones more recently. “Hey, I found a property corner marker over here,” said Jim, “and here’s another one.” There were two USFS corner markers nearby, placed about 20 feet apart. “Sometimes they’ll separate out a small piece of property just for a cemetery. It might only be 20 feet by 20 feet.” We looked for other corners, but those two markers were the only ones we found. After taking more pictures and paying our respects, we walked back along the old road to the homestead site in the saddle. The road led up the far hillside and we followed it. It ended at two large ‘tank trap’ berms that had been pushed up across the old road to block any vehicles from using it. The berms were a bit overgrown with trees and vines. Just beyond the berms was the gravel road. I had seen the berms when we walked by on the gravel road earlier but mistook them for just a drainage pushout. None of us had noticed the old road beyond them. We debated about where to head next. 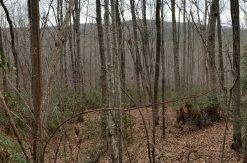 “Let’s follow the gravel road a bit farther to the south and then look for a place to bushwhack over to the Birkhead Mountain Trail,” I suggested. We knew there were several privately-owned inholding properties in this area. No trail or road led around them, so we would have to bushwhack to avoid trespassing. The gravel road was most likely an easement allowing these property owners to cross USFS property to reach their own. The forest undergrowth was pretty thin, especially this time of year, so walking cross-country was not difficult. We hopped over a couple small streams in a valley and soon found ourselves looking up the rising slope of Cooler’s Knob Mountain. Did you enjoy reading about this rediscovery of the Tadlock homestead and lost Uwharrie Trail camp? If so, please leave a comment below! 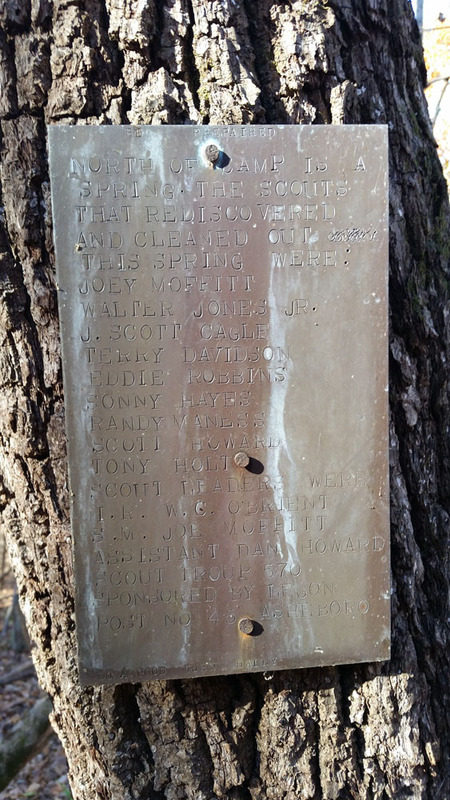 This post is part of a series about ‘lost’ Uwharrie places. The Uwharrie Lakes Region Trail Guide is an excellent resource to help you follow the trails. Some of the ‘lost’ places are along the trails, but others are a little further out of the way. Please subscribe to my mailing list so you don’t miss future posts in this series. 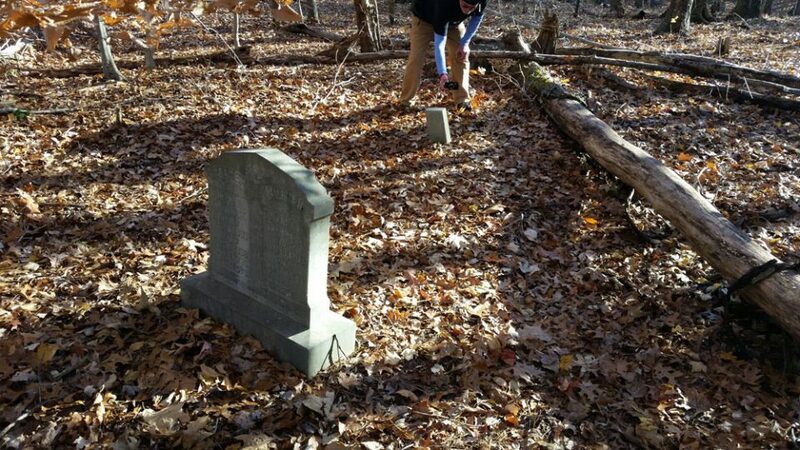 The Uwharrie TrailBlazers will be hosting a members-only hike in January 2018 to visit the Tadlock graves. 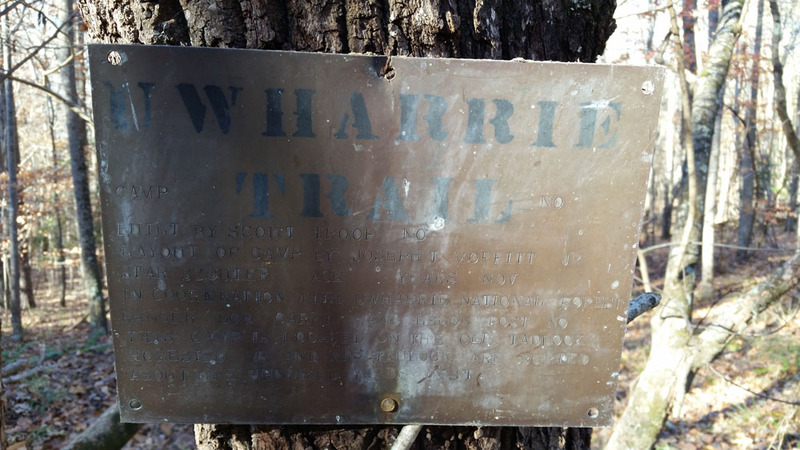 If you would like to participate in that hike, consider joining the Uwharrie Trailblazers and supporting the work they do to maintain and reconnect the Uwharrie Trail. See the Uwharrie Trailblazers Facebook group for additional information about the group. Great reading this lost part of the uwharries. Keep exploring and telling the story. Thanks Don, Joe White, and Jim Plant. You’re welcome, Marcus! This is just the beginning. Look for more stories like this in 2018. And perhaps some organized trips to go exploring! Great writing about the rediscovery of “lost” markers for a couple of what must be many “lost history” sites in the UNF. Boggles the mind to think about all that must be out there. Thanks, Roger! You’re absolutely right! I have a list of a dozen or so ‘lost places’ I plan to search for in the upcoming year. Hopefully, I’ll be able to find something left that can be documented and shared with others so these places aren’t lost forever. Nice story Don. After I had heard about your discovery, I went looking for old maps of the Tadlock Graveyard. I found one that had the exact plot that you have in your map posted in the blog. I look forward to seeing it for myself on the members hike this month. Nice. Which map did you find that on? Yes, the hike should be fun! If anyone wants to find something at Birkhead just head cross country and you will eventually discover it. Just this past week I came across an old chimney still standing and it’s located within the USFS boundary. It is very fragile but in nice shape, hopefully the wrong people won’t come across it. There is also another one still standing on the east side of Birkhead, along with many rock walls. Hi Derek. There is certainly more stuff off the beaten track than on it! I’d love to hear more about those two chimneys and rock walls. Loved your story! Keep them coming. I knew I remembered seeing a small track on the GIS website for a cemetary. 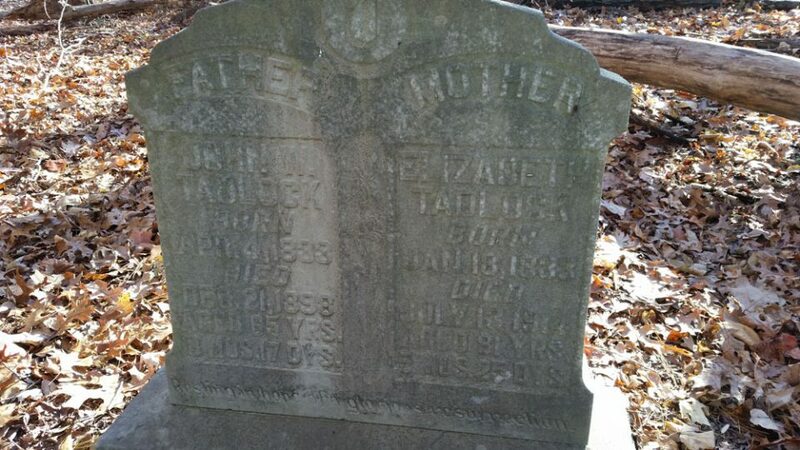 It goes by the name of Lillie Vuncannon Cemetary, just .10 acre within the Birkhead tract. If you look closely on some of the forest service maps you can also see the cemetary plot. If you head almost exactly due east from the Tadlock cemetary right at the Birkhead boundary before Cooler’s Knob you can find the old plane crash site as well as a still. Not to detract from the Tadlock gravesites but here are the coordinates to the chimneys that are still standing. Keep the stories coming. I’ve been a lifetime “woods walker” but your guide has inspired me to get more serious about hiking and exploring. The old plane crash site is on my list. I’ll also check out the chimney locations. I wonder if we can figure out whose homesteads they were?